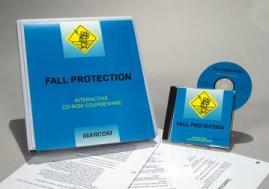 MARCOM's "Fall Protection" Interactive CD-ROM Course provides the information employees need to work safely when they are "off the ground", and satisfies the major training requirements in the OSHA Standard on Fall Protection. Falls are the second leading cause of death each year in the United States (after traffic accidents)! Over 10,000 people are killed every year as a result of falls...and 200,000 to 300,000 people are disabled. Eight-five percent of all falls that occur on the job result in "lost work time". Areas covered in the course include the seriousness of fall hazards, types of environments where falls may occur, the "fall protection plan", concentrating and keeping a clear head, the importance of housekeeping in preventing falls, measures that can be taken to protect against falls, protective equipment, and more. Using a powerful combination of audio, full-motion video, text and colorful graphics, this course provides the most cost-effective safety and regulatory compliance training available today. The course is divided into a number of logical sections so information is easily understood... and retained. Also designed with the training manager in mind, all courses in the Interactive CD-ROM Training Library include a learning management system (at no additional cost). Using this system, trainers can set up "Pre" and "Post" tests... establish log-in procedures... even define and set up curriculum for various job classes. The system also collects and organizes employee performance information through a powerful relational database, which can generate a number of record-keeping and tracking reports... and has a database "import/export" feature, which allows information to be transferred to and from an external database (such as a company's personnel database). The course is one of over 100 titles currently available in the Interactive CD-ROM Training Library.